Jim Campbell lives in Brooklyn, NY and has been drawing comics off and on since teaming up with the Meathaüs collective in 2001. In addition to numerous anthologies, his 2005 book Krachmacher was published with a Xeric grant. 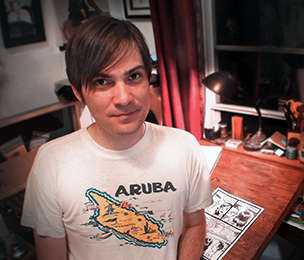 His day job is working as a colorist for Dark Horse, Marvel, Spongebob Comics, Mad Magazine, and Tony Millionaire, and drawing storyboards for Cartoon Network. In his spare time, he plays in the Brooklyn band Paper Fleet.